That’s it, all done and I’m happy to report that I’m now pain free as far as my lower back and leg go for the first time in years. I’m still sore from the surgery but this will settle down over time, especially once the ‘staples’ have been removed and things heal naturally. The biggest surprise for me was that on arrival at the hospital and being seen by the consultant neuro-surgeon, he told me that he had decided not to do the trial run but to go ahead with the full and final procedure there and then. This was a fantastic bonus for me, as it meant that there would only be one procedure and not two which obviously meant only one visit and less time in hospital. I’m told that the procedure is relatively simple. 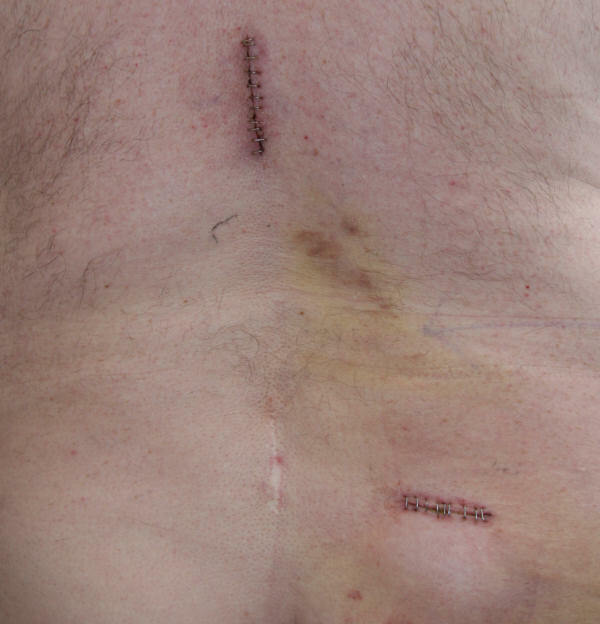 They made an incision just below the shoulder blades and placed one end of the lead along the spinal cord. This end ‘forks’ and has a number of electrodes which transmit the stimulation to either side of the cord. The lead was then ‘threaded’ along the spine to the stimulator unit that was placed in a ‘pocket’ cut just above my right buttock, which has left me with a nice small hump. Once the surgical part of the process had been completed, a technician then calibrated the stimulator and loaded the different programs that vary the types on stimulation available. This took some time as there are so many variables to consider but once completed, it gives me total control over how the pain is managed. The stimulator unit itself is controlled from a remote control which I hold over the buried unit when I activate any of the buttons to change the stimlation level or type. The stimulator runs on rechargeable batteries which should last for years, meaning I don’t have to be cut open to have them changed (phew). The charger is a small disc-like unit which sits in a recharging base station. When I need to recharge the stimulator, I am prompted by the remote, I then take the charging disc and stick it on the skin over the stimulator using a double sided sticky pad. The charge then passes through my skin to the stimulator beneath. The remote lets me know once it’s charged and I’m ready to go again. This whole thing has meant the start of a new life; free of pain and freedom to do the the things I had previously taken for granted. Needless to say, I’ll be making the most of it once I’ve got the soreness out of the way and it’s declared safe to do so. A big thank you to the manufacturer of the ‘Precision Plus‘ Spinal Cord Stimulation hardware that’s made this possible, Boston scientific, the staff at Hurstwood Park neurological unit at the Princess Royal Hospital in Haywards Heath for their kindness and professionalism. Many thanks to Dr. Stephen Ward and James Akinwunmi for their work in obtaining this treatment for me and James in particular for doing the surgery. Apologies to those of you bored enough to read these pages for the recent lack of reports. I’m afraid I’ve been laid up with the chronic back pain I suffer from, so haven’t managed to get out much. However, I think this may be about to change. After a long battle, I’ve finally been given the go-ahead to have surgery that means I could be pain free for the first time in years. I’m absolutely over the ****in’ moon. The procedure is called Spinal Cord Stimulation and in simple terms, consists of an electrode inserted in the spine and pulses are sent along the electrode from a ‘magic box’ that is implanted nearby. The pulses replace the pain sensation with a tingling which is slightly more desirable. The whole thing is managed by a remote control which can be used to vary the levels of the pulses. Here’s a video presentation for anyone who is interested. I’m booked into hospital for 9th October for the trial which should last for about 2-3 weeks. If that is sucessful, then I’ll have the full implant done immediately. I’ll update the progress here for the sake of anyone reading who may be in a similar situation and is considering or has been offered this treatment. Looks like I’ll be missing some fishing in the mean time while it’s all being sorted but that’s a small price to pay to be pain free. This also gives Seaford beach a chance to build up its stocks ready for my return. Just gotta keep me fingers crossed that it works.